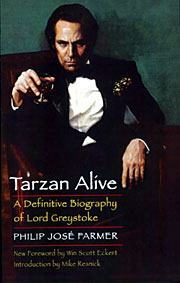 Tarzan Alive, a fictional biography of the famous Edgar Rice Burroughs character, is the foundation of an important aspect of Philip José Farmer's oeuvre: the Wold Newton Universe, which postulates that all of adventure fiction constitutes one shared universe, that in fact it comprises a secret history of the real world. Bison Books has reprinted this fun and endlessly intriguing classic with extra material, including a foreword by Win Scott Eckert - the editor of Myths for the Modern Age, a 2005 anthology that expands on Farmer's metafictional work - and two other Farmer texts: an interview with Tarzan, and excerpts from Tarzan's private journals. In Tarzan Alive, Farmer proposes that Burroughs's books are fictionalized versions of a real man's adventures (with names, places, and dates altered), a man Farmer claims to have identified and tracked down. Farmer then recounts the shocking "true" history of Tarzan. His "investigations" unveiled more surprising information: that other "fictional" heroes - Sherlock Holmes, Doc Savage, the Shadow, and many more - are also real and that they are all related, with a common ancestor having been exposed to a radioactive meteor in Wold Newton, Yorkshire, causing strange mutations in that gene pool. The metafictional games of Tarzan Alive have inspired not only Farmer himself to pen a sequel (Doc Savage: His Apocalyptic Life), not only the anthology Myths for the Modern Age, but also collaborative websites where dedicated fans and scholars further speculate on the secret history that lurks between the lines of literature. The Montreal Gazette, Saturday, 17 June 2006.
section of The Montreal Gazette. non-fiction - Claude Lalumière's Fantastic Fiction; other infinity plus reviews; non-fiction features by Claude Lalumière.